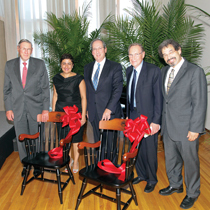 Lester Crown; Naghmeh Sohrabi, the Charles (Corky) Goodman Chair in Middle East History; President Fred Lawrence; Corky Goodman, G'09; and Provost Steve A.N. Goldstein ’78, MA’78. The Crown family of Chicago made a major gift to Brandeis that will create three new endowed faculty chairs and help to provide a permanent home for the Crown Center for Middle East Studies. Lawrence also praised Shai Feldman, the Judith and Sidney Swartz Director of the Crown Center, as “the driving force behind a center that has produced pathbreaking scholarship that expands understanding of this critically important part of the world,” as well as Provost Steve A.N. 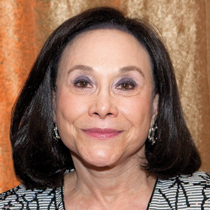 Goldstein ’78, MA’78, who was instrumental in securing the gift. Feldman says the Crowns are focused on the substance of the center’s work. “Gratitude, recognition, ceremonies and names on walls don’t interest them at all,” he says. Crown family support for Brandeis long predates the founding of the Crown Center. In 1968, the Crowns established the Irving and Rose Crown School of Graduate Studies in American Civilization and created the Crown Fellows program to fund its students’ work. Feldman says the center’s priority study areas and the availability of top scholars will determine the exact nature of the endowed faculty chairs to be funded by the gift. The study areas are Syria and Lebanon; Turkey; the politics of Saudi Arabia and the Gulf states; and sectarianism, tribalism and ethnicity in the Middle East. All the new chairs will be located in the university’s academic departments. The gift will also help to secure a permanent home for the Crown Center. Bolstered by strong support from young alumni, the senior class and donors who gave online, Brandeis again surpassed the $60 million mark in cash gifts for fiscal year 2012. Donors made gifts totaling $60,999,486 in the fiscal year that concluded on June 30, marking the 13th consecutive year Brandeis raised at least $60 million. Thanks to the new Bold (Brandeisians of the Last Decade) program, giving among alumni who graduated during the past 10 years jumped 23 percent from the previous year. In another sign of a bright future ahead for Brandeis fundraising, an all-time high of 75 percent of the Class of 2012 contributed to the senior class gift. During fiscal year 2012, Brandeis also met the $1 Million Online Giving Challenge by raising $1,003,196 through the university’s secure giving website (givingto.brandeis.edu). The previous online high for a single year was $698,573, established in fiscal 2011. Online giving to Brandeis has more than doubled over the past three years. The leadership of the Brandeis Alumni Association, which includes the Board of Directors and presidents of alumni clubs around the world, gave gifts totaling $472,772, an all-time high and an increase of 22 percent over last year. I am happy to report that, as I begin my 19th year as Brandeis’ senior vice president of institutional advancement, I have never felt so much excitement and optimism from Brandeis alumni, parents and friends. The alumni feel a deeper connection to their alma mater, the parents recognize that their children are receiving (or have received) a world-class education, and our friends understand that Brandeis is a truly unique place. On a recent visit to Toronto, where most college students attend one of Canada’s great public institutions, I heard parents share stories of the personal attention and mentoring their children had received from our faculty and how they felt the additional financial investment they had made in a Brandeis education was worthwhile. 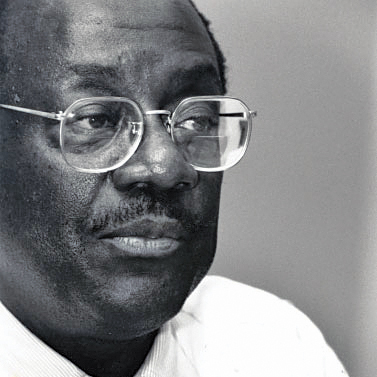 President Fred Lawrence continues to inspire us. Every place he travels, he makes new friends for Brandeis and further engages all our constituencies. He has also re-energized the campus, and infused students and faculty with a profound sense of pride. There’s a new school spirit, evidenced by the large crowds at athletic contests and Rose Art Museum events. The entire Brandeis community is looking forward to the January release of the Strategic Plan, which will provide a road map for the university for the next 10 to 20 years and take us into our next comprehensive fundraising campaign to support the plan’s highest priorities. There is no doubt that Brandeis will make changes in the coming years, as will all our peer institutions, but our core values, which are shaped by our Jewish roots, will continue to inform our future. 1. Mervin Gray, Arthur Novakoff and Nancy Winship, P’10, P’12, senior vice president of institutional advancement. 2.Lanxin Li ’13, the inaugural Dr. Rose Jannini Scholar; Ralph Jannini; Hill; President Fred Lawrence; and the Gorbachs. Nearly 300 people visited campus as Professor Anita Hill delivered the keynote address at the annual Sachar Legacy Society luncheon, chaired by Sherwood ’55 and Judith Gorbach ’58. Legacy Society members have included Brandeis in their estate plans. President Fred Lawrence; Dor Guez, the Ruth Ann and Nathan Perlmutter Artist in Residence; Bedford; and Kathy Lawrence. Brandeis alumni and friends welcomed Christopher Bedford, formerly the chief curator of exhibitions at Ohio State University’s Wexner Center for the Arts, as the new Henry and Lois Foster Director of the Rose Art Museum. Provost Steve A.N. Goldstein '78, MA'78; Malcolm Sherman, P'83, chair of the Board of Trustees; Patricia Gruber, president of the Peter and Patricia Gruber Foundation; Rosbash; and President Fred Lawrence. 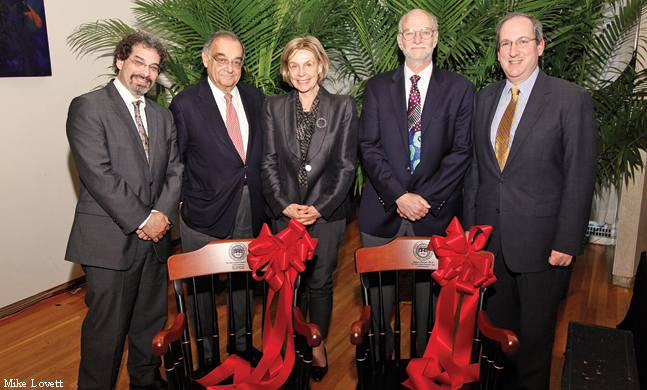 The Brandeis community gathered to celebrate the establishment of the new Peter Gruber Chair in Neuroscience. Award-winning biologist Michael Rosbash, whose research has provided important insights into the brain, health and sleep disorders, is the first member of the faculty to hold the chair. The tough love that the late Joe Warren, Heller MSW’72, PhD’83, frequently administered as the longtime director of Brandeis’ Upward Bound program was colorblind. Warren treated every student — white, black or Hispanic — who participated in the pioneering college-access program the same. It’s only fitting, then, that a diverse group of Brandeisians have come together to honor him. To memorialize the man who changed the trajectory of hundreds of teenagers’ lives by steering them toward college, Regan joined fellow Upward Bound alumni Curtis Tearte ’73 and Jose Perez ’75 in making a generous gift to establish the Joseph D. Warren Endowed Scholarship at Brandeis. The scholarship provides need-based financial aid for students with a demonstrated interest in social justice who come from a low-income family. Preference is given to students who are the first in their family to attend college. Warren, who died in 2010 at the age of 71 after a lifetime of helping the less fortunate, led the Upward Bound program at Brandeis from 1970-73. Through Upward Bound, Warren recruited promising high-school students from around the Northeast who then spent two consecutive summers at Brandeis getting ready for college. Classes focused on the core disciplines of math, English, science and history. “I learned from Joe that you really need to be cognizant of where you are in life and how you can do something for others who are behind you,” says Tearte. For more information or to make a gift to the Joseph D. Warren Endowed Scholarship, contact Alan Bertman, director of special and annual gifts in the Office of Development and Alumni Relations, at 781-736-4032 or abertman@brandeis.edu. O Canada! With glowing hearts, dozens of alumni, parents and friends attended a launch party in Toronto hosted by former Trustee Len Asper ’86 and his wife, Susan, for the new Brandeis-Canada Endowed Scholarship, an effort by Brandeisians from Canada to support students from their country and to raise the university’s profile north of the border. Organizers hope to raise money to fully endow the scholarship from as many alumni and friends as possible — from New Brunswick in the east to British Columbia in the west. In all, about 1,000 Brandeis alumni, parents and friends live in Canada. The scholarship is designed to serve as an incentive for Canadian students to attend Brandeis, helping to offset the cost difference between the university and Canada’s state-subsidized system of higher education. 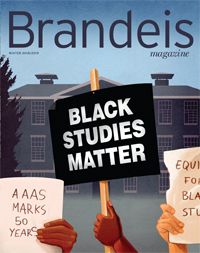 A total of 28 Canadian students — 14 undergraduates and 14 grad students — currently attend Brandeis. “Brandeis has not been on the radar screen of many Canadian students, but we think there are some very capable students who would find the personal attention and small community at Brandeis attractive,” says Myra Novogrodsky ’68, Charles’ wife and another scholarship organizer. For more information about the Brandeis-Canada Endowed Scholarship, contact Karen Rogol, director of alumni and university relations, at 781-736-4106 or krogol@brandeis.edu.